Framfield footpath 9, the notorious ‘Hoogstraten’ footpath, was illegally obstructed for 13 years, from 1989 to February 2003. This is the story of how the Ramblers and I got it reopened. Framfield 9 in East Sussex runs south from Palehouse Common Road, and is part of a route from Framfield village which was recorded on the Framfield Manor enclosure award of 1862. In 1989 a local member of the Ramblers saw a barn being built over the path and was accosted by a contractor on the estate who told him to use another route. He reported this repeatedly to East Sussex County Council (ESCC), the highway authority, over the years but nothing was done. ESCC, which was concerned that its staff might be at risk, and the police appeared to be intimidated by the landowner, property tycoon Nicholas van Hoogstraten. Subsequently padlocked gates were erected across the path and container-sized refrigeration units were placed there. In 1998 the Ramblers’ central office took on the campaign, and at the same time Hoogstraten broadcast his obnoxious remarks about ramblers, calling them ‘riff raff’ and ‘scum of the earth’, so the campaign acquired a high profile. In January 1999 the Ramblers’ president Andrew Bennett MP led a walk along the blocked path accompanied by the police. The following day, a six-stranded barbed-wire fence was erected where the path joins the road. Publicity and pressure on the council having failed, the Ramblers began legal action in the magistrates’ court, for obstruction of the path under section 137 of the Highways Act 1980. It was complicated by a change in landownership from Nicholas van Hoogstraten to a shadow company, Rarebargain Ltd, which delayed matters. Eventually the case came to Lewes magistrates’ court in January 2000 where I appeared as a witness for the Ramblers. Rarebargain was found guilty of obstruction and was fined £1,600 and ordered to pay the Ramblers’ costs of £3,500. The obstructions were not removed and the fines and costs were not paid. In March 2000, after much pressure from the Ramblers, ESCC served notices on Rarebargain ordering removal of the obstructions within 90 days, under section 143 of the Highways Act 1980. However, shamefully, it also said that if Rarebargain came up with a suitable diversion, it would put the notices on hold. Encouraged by this, Rarebargain did come up with a diversion route, avoiding the obstructions. This was published for consultation in July 2000 and received 5,000 objections (because of course we encouraged members of the Ramblers and the Open Spaces Society to object). This number of objections must be unprecedented for a diversion consultation and it was contrary to ESCC’s policy on processing public path orders which said that an application would only be dealt with when the definitive line of the right of way was open, signed, clear and safe to use and the removal of any obstruction was not reasonably achievable. ESCC ignored the objections and its policy and published a formal diversion order. This attracted 2,000 objections, again surely unprecedented, yet ESCC ploughed on and sent the order to the Planning Inspectorate in June 2001, to be determined by a public inquiry. Meanwhile, during 2000 the Countryside and Rights of Way (CROW) Act was going through parliament. Because of the high profile of the Framfield case with Hoogstraten’s fulminations against ramblers, and the fact that an ordinary prosecution in the magistrates’ court had failed to remove the obstructions, the Ramblers pressed for a clause which would require obstructions in such cases to be removed. When the clause was discussed in both the commons and the lords, members referred to Hoogstraten. Clearly the clause was designed to deal with cases such as his. The section came into force on 30 January 2001. I wanted to be the first to test it and on 1 February 2001 I returned to Framfield. All the obstructions were still in place so I served notice of them, under section 137 of the Highways Act, that day at Lewes magistrates’ court. The case was heard on 20 March 2001. Rarebargain did not appear. I was represented by Ramblers’ solicitor Jerry Pearlman. Rarebargain was found guilty of obstruction on all four counts (barbed-wire fence, padlocked gates, refrigeration units and barn) under section 137 of the Highways Act 1980 and was fined the maximum of £1,000 for each. Under the new CROW Act provision, the magistrates ordered the fence, gates and fridges to be removed within 28 days and the barn within six months. After the 28 days I returned and all the structures were still in place. So I was back in the magistrates’ court on 3 July and the magistrates fined Rarebargain the maximum of £5,000 each for the three obstructions which had not been removed within 28 days. I returned in September after the six months for the barn had expired. It was still there so I went back to court and, on 29 November, the magistrates fined Rarebargain £5,000 for failure to remove the barn plus the maximum daily fine for the other three obstructions (£250 per day per obstruction for 81 days, total £60,750). They ordered Rarebargain to pay my costs of £3,400. I could have continued to return to the magistrates’ court for more daily fines, but this would have served no useful purpose if Rarebargain did not pay. By now it owed £93,250. In any case, it had no assets, being merely a paper company. The magistrates did make some attempt to recover the money but without success. Also, I feared the magistrates might get annoyed with me reappearing on something which might be thought a technicality, so I stopped while I was winning. Those costs and fines would have been sufficient to deter an ordinary landowner, but as we know, Hoogstraten was no ordinary landowner. The problem was that companies could get away without paying fines. As a result of this case, the government drafted a bill which Michael Foster, Labour MP for Hastings and Rye, adopted when he came 16th in the private member’ ballot in 2003. His Highways (Obstruction by Body Corporate) Act 2004 ensures that, when a corporate body is fined under section 137 or 137ZA of the Highways Act 1980, the fines can be collected from a director, manager, secretary or similar officer. In future, companies like Rarebargain would be required to pay. Back to Framfield, and in September 2001, with the diversion order now before the Planning Inspectorate, I lodged a judicial review against ESCC for failure to take action against the obstructions. In view of this the Treasury Solicitor agreed to put the diversion order on hold (thanks to Sophia Lambert, Director of Wildlife and Countryside at the Department for Environment, Food and Rural Affairs, who asked for this to happen). This was important because the diversion order might have been confirmed before my judicial review concluded its passage through the courts. My argument was that ESCC had acted unlawfully in failing to remove the obstructions. ESCC seemed to think that because the path was obstructed by a barn, it was reasonable to seek a diversion around it. 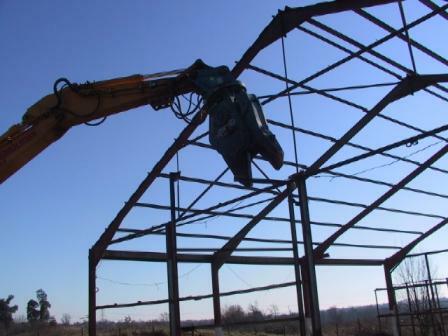 However, I argued that the magistrates had ordered the removal of the barn and therefore they considered it could be moved. The hearing in the high court was on 11 March 2002. I was represented by barrister David Wolfe. The judge was Mr Justice Grigson. I lost the case, but unusually the judge himself gave me leave to appeal and did not order that I pay ESCC’s costs. I appealed to the court of appeal. The case was heard on 14 October. I was represented there by George Laurence QC and David Wolfe, and my solicitors were Jerry Pearlman and Naeem Siraj. My legal team was fantastic, I was extremely fortunate. George Laurence presented a number of arguments, but the principal one was that the council had failed to follow its own guidelines and had processed a diversion for an obstructed path when the removal of the obstructions ‘was reasonably achievable’. He argued that the court should quash the council’s decision to submit the contested diversion order to the Secretary of State. The court (Lord Justice Schiemann, Lady Justice Arden and Lord Justice Dyson) agreed and in their judgment of 20 November 2002 upheld the appeal and quashed the council’s decision. They considered that the path had been deliberately obstructed and consideration should have been given to that fact by the council, as well as the fact that the magistrates had ordered removal of the obstructions. The council was ordered to pay my costs. The judgment contains much quotable material which can be used when fighting path-blocking landowners and weak councils. ESCC therefore had to reconsider its decision to submit the contested diversion order to the Secretary of State. However, it was let off the hook because by now the land had changed hands, Rarebargain having gone into liquidation. The liquidator told ESCC that he did not wish to proceed with the diversion order. 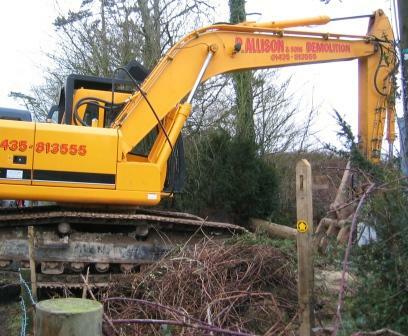 At the end of January 2003 ESCC served a legal notice, under section 143 of the Highways Act 1980, on the liquidator for removal of the obstructions. 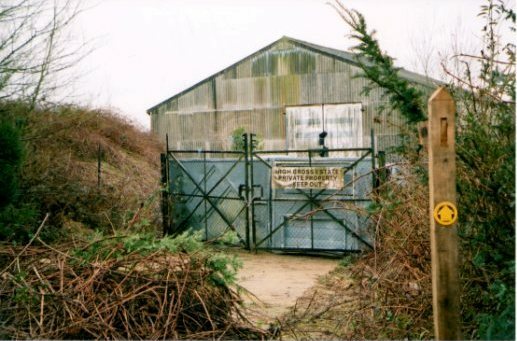 The liquidator did proceed and on 10 February 2003 we had a celebratory event at Framfield, to cut the wire and the padlock before the machinery moved in to clear the site. The case cost the council over £100,000. Obviously if the council had seen through its original notices in 2001 instead of processing the diversion, the path would have been cleared much sooner at a fraction of the cost. The message from the court was clear. Highway authorities are expected to carry out their statutory duties to reopen paths instead of seeking diversions around the obstructions. It should not be left to members of the public to do the job of highway authorities. For an excellent nine-mile walk from Uckfield which takes in the path, see here. Footpaths were designed for surfs/peasants to pass through land so they could serve their superiors more efficiently, not so they could go for a stroll sticking their noses into other peoples business. If serfs were found doing that when they should have been using the footpaths for their original intention they would have lost their jobs or worse. It is only because of archaic laws you were able to semi-win this case. I for one do not agree with designated footpaths passing through private land. Also you cost the tax payer £100,000 when Nick has paid millions of pounds in tax over the years; it should be proportioned that people who contribute to the economy such as Nick should have special privileges over people like you who are trying to uphold ancient paths and costing the tax payer money. Needless to say I totally disagree! In point of fact the statutory framework and basis for the public rights of way network is of the modern era, rather than on archaic laws, though of course based on the long-standing premise of adopted highway and established common law. Nick v. H of course is probably one of the leading most pleasant people in the UK to do business with. He appears also to have (tax) sheltered most if not all of his assets in overseas havens such as Bermuda and in the name of his children. The amount of tax he has paid over the years appears to be in the same league as that contributed by another ‘real estate magnate’ currently vying for the regeneration opportunity of the White House and the United States of America. Can you send me a grid ref please? I’ll see if I can help, many thanks. He is well known to the Parish council. Your help and experience would be a Great help. The lovely, cuddly, fluffy “Nick” should be strung up by us “riff raff” “scum” from a stout Oak tree on his estate, to serve as a deterrant to others who think they are above the Law. A summary justice I believe, baring in mind his history, he would appreciate. Hi, I too am frustrated at the obstruction on Footpath 372/8. Did anything come of the replies above please? Thanks, I now have details of where it is but haven’t followed up yet, I don’t know the path but am happy to report to Oxfordshire CC. Will see if I can visit. Thanks Kate, very much appreciated. I have been truly inspired by your work and I am writing to request your expert advice on a ” mini hoogstraten” that has been ongoing for the past year and a half in our village. “it is indefensible for a landowner to take the law into his own hands and deliberately block a footpath rather than apply through the appropriate mechanisms for a Diversion Order.” Lord Justice Arden. Our next door neighbour, a Parish Councillor, erstwhile Rights of Way Committee member( during which time they obstructed a PROW) has obstructed and unlawfully diverted a PROW and is now trying to force a new footpath in our garden right next to that which has been legally mapped since 1952. 2005: Parish Councillor obstructs PROW on purchase. Vendor permits walkers to walk the unlawfully diverted route to facilitate their sale of the public right of way to the Parish Councillor. 2015: Parish Councillor is notified by the Council that the PROW lies in their garden. Jan2016: Council confirms position of PROW in Parish Councillor’s garden. March 2016 : Council confirms to the Parish Council that PROW has been obstructed. June 2016 : Parish Councillor asks to buy from us the unlawfully diverted route but then starts the process of applying to place a PROW in our garden. August 2016: Council serve notice on Parish Councillor to remove obstruction. August 2016 : application to place PROW in our garden next to legally mapped PROW since 1952 based on 50 years use prior to that date. August 2016: the Council served notice on the Parish Councillor and is satisfied that the path is now “open”. This is despite the fact that the PROW remains blocked by a closed gate and that there are NO finger posts and that there is no discernible path on its definitive legal line. September 2016: all evidence including even the user evidence submitted by the Parish Councillor shows that the walked route has not been in our garden for 20 years but on the definitive legal line of this old public right of way. My question is: even if the Council does not decide to confirm the order which would place a PROW right next to that which was deliberately obstructed by those flouting the law, the Parish Councillor can appeal. This means that for a further 18 months the public right of way will be out of use and the matter will remain unresolved. All in all since we notified the Parish Councillor of the law which relates to their property, this process could have potentially lasted over 3 years. The Ramblers have published an inaccurate article in the local paper which commented incorrectly on the case in question. The Council requested that they refrain from commenting on individual cases such was the level of misinformation that was reported. How can we make sure that the law is upheld? How can we ensure that this old footpath is accessible to the public? I would very much appreciate your advice on this matter.